A volume of more than sixty tales, hymns, poems and other literature, this manuscript was written by several scribes, two of whom left evidence of when and where it was written. The main scribe appears to have been in Connaught in the country of the O'Conors, which would be somewhere in Roscommon. The manuscript contains an obituary and eulogy of Art buidhe Mac Murchadha Caomhanach, who died in 1517, suggesting that the scribes were still writing it for him when he died. Among the tales and poems it contains, the 'Amra Colum Cille' ('Eulogy for Columba') and 'Tan Bo Cuailgné' ('The Cattle Raid of Cooley') are among the most important and well-known works of early Irish literature. 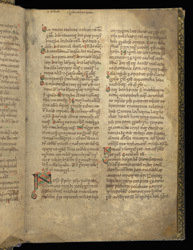 The "Fefeis fer falga," or the story of the plundering of the Isle of Man by the men of Ulster under Cuchulainn, begins on this page, at the large, red-and-green letters 'IN' ('Incipit', Latin for 'It begins'). The manuscript is not heavily decorated, but it does retain the Irish traditions of handwriting style and letter forms which go back to the 7th century.